A merchants brand and how it is perceived to consumers is paramount. Ensuring the brand is being promoted in a positive light is as important as anything else a company can do; but how do merchants with affiliate programs monitor their brand and its use? Sadly, many merchants do not monitor affiliate activity in terms of brand bidding and it costs them money (sometimes significant amounts). Under the “Tools” tab click “Monitor Search Keywords”. 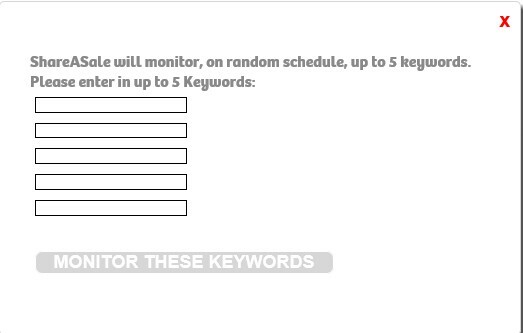 This is where merchants will add keywords that ShareASale will monitor. They can add up to five (5) for them to monitor. Put the most important (or popular) branded keywords in and ShareASale will send alerts if violations occur. Now we are getting to the nitty gritty. This step is where merchants provide rules that affiliates must obey when using PPC campaigns. Merchants can add a rule that affiliates cannot use PPC bidding at all, but if allowed to, then specific rules can be set. Adding keywords that are off limits to affiliates will be compiled to a list that will be available to all affiliates upon signing up for the program. Completing this section will tell the affiliates from the beginning the stance on PPC bidding. Merchants should protect their brands by all means necessary. There are affiliates that abuse the PPC rules, but ShareASale has a nice tool to help monitor violations, but recommended to compliment this is signing up for a brand monitoring software (i.e BrandVerity). Merchants do not want to lose control of their brands, especially when there are ways to prevent it.